May this information reach you while you are in the best of Iman and health by the Grace of Allah Subhāna-hu wa Tacālā. We would like to announce that our khatib for this week is ASST. 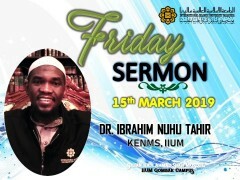 PROF. DR. IBRAHIM NUHU TAHIR from Department of Economic, Kulliyyah of Economics and Management Sciences. May Allah Subhāna-hu wa Tacālā bless all of us and place reward of our good efforts in the Mizan al-Hasanat.